Let's go ahead and start off with the fact that I'm biased. There has yet to be a Matt Mikalatos book that I've read that I've not enjoyed. I'm thankful to say that this one did not make me cry. You can reference previous reviews if you don't know what I'm talking about. 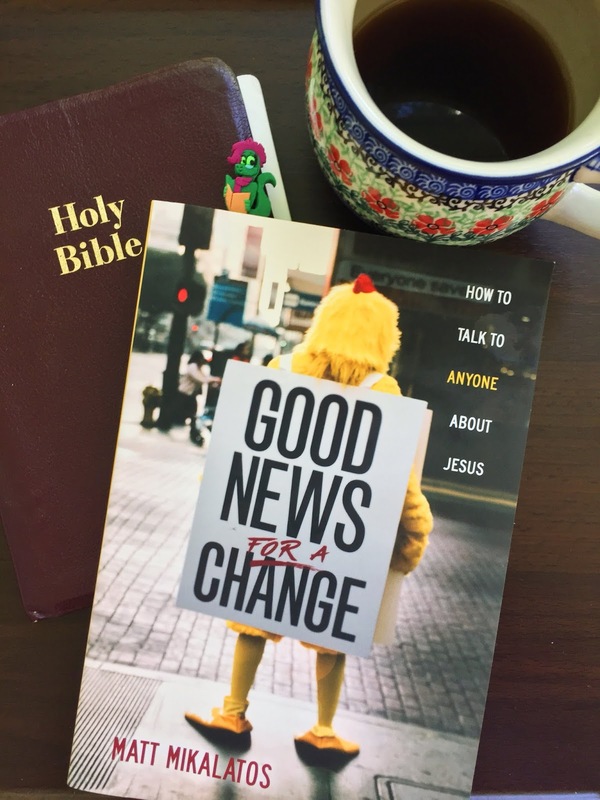 Good News for a Change is a pretty quick read if you don't do the homework. My suggestion would be a quick and then a slow read because there's a ton of information and how to apply it in these pages. Mikalatos systematically goes through most objections on the part of not only the evangelist by also the evangelized. Throughout though, it's made clear that God can and has used a wide variety of ways to reach people, including those ways that may seem outdated or harsh. The main emphasis in the book about sharing the good news is making it heard in the language of the hearer. By the end of the book, you should not only be aware of how to share the good news in someone's native tongue or dialect, but comfortable in doing so. When I say native tongue, I'm not referring to completely foreign languages, though the same can be applied. I'm referring to using the words and lingo that others are most comfortable with. So much of language is built upon a common word base, but I can testify to the fact that even between regions in the United States, there can be a huge language barrier. Since Joel is from the Pacific Northwest, I'm from the South and we live in the Midwest, we notice it quite a bit. To give you an example, what do you get when you order tea in a restaurant? Is it hot, cold, sweet? How to learn those nuances can be part of sharing the good news with people. Mikalatos does a great job of showing how simple it can be to share the gospel with others, using examples such as Bronies, Aethist, and door to door salesmen. After reading the book, I feel more confident and encouraged to share the good news with others. I'm on the lookout for those in the darkness. I'm also looking forward to going back and re-reading this one and taking the time to work through the reflection questions and exercises at the end of the chapter. I'm never required to give a good review but I'm always thankful when I can. NavPress has provided me with a complimentary copy of this book.